Buried away in a recent news item were two sentences that should shake the Israeli left out of its slumber. 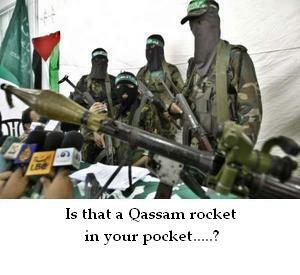 The other day, Israeli media reported that the security services had captured 3 Palestinian terrorists from Gaza who had been sent to Judea and Samaria to establish factories for the manufacture of Qassam rockets and mortar shells. Their mission, they said, was to build the rockets and then fire them straight into Israel’s major metropolitan areas, as well as carry out a range of other heinous attacks. Had they succeeded, places such as Tel Aviv, Netanya and Kfar Saba might all have come under enemy fire. So, in effect, rather than making “central Israel” safer, the Gaza retreat has only brought the threat posed by Palestinian terror even closer to Israel’s financial and industrial heartland, giving the terrorists greater opportunities, and incentives, to launch attacks. Something to think about, especially for all those who supported Israel’s retreat. This time around, thank G-d, the terrorists were caught before they could do any harm. But who knows if we’ll all be so fortunate in the future.